This flag is similar to the current, with the left side cut of and changed. It’s majority blue colour symbolises our great ocean which sourounds our country. This colour is a great choice for a flag, as it looks good. The triangle shape represents a tool, the boomerang, used by the indeginous people of Australia, the first people of our land. The commonwealth star with 7 points symbolises our 6 states and territories. Overall a good simple design. The design is an evolution rather than a replacement of the current national flag, with the shape of the stylized boomerang replacing the union jack. 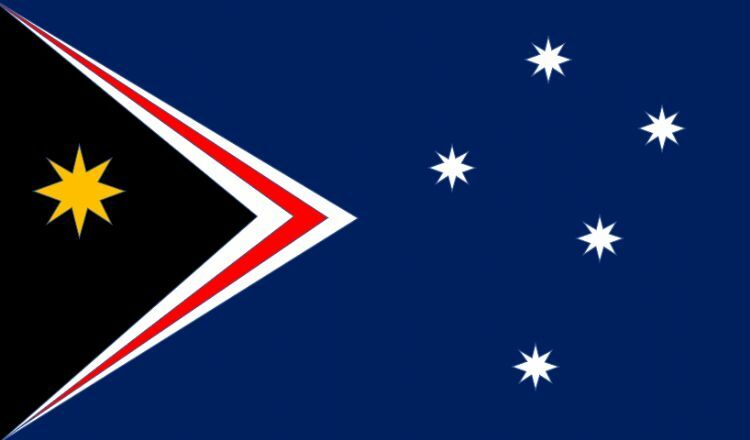 The southern cross is maintained, and the Federal Star has 8 instead of 7 points to reflect all states and territories. 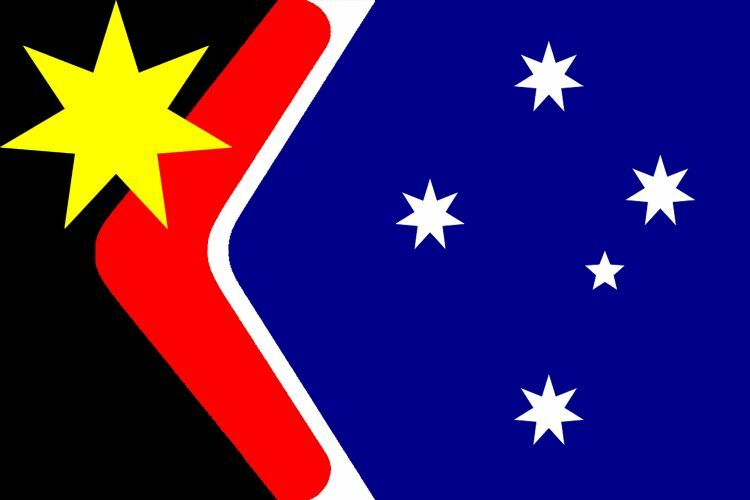 One variation has the southern cross positioned similarly to the Eureka flag, while another one adopts colors from the aboriginal flag. Yellow sun Black and red from Aboriginal flag, Yellow also represents the "golden soil and wealth for toil". 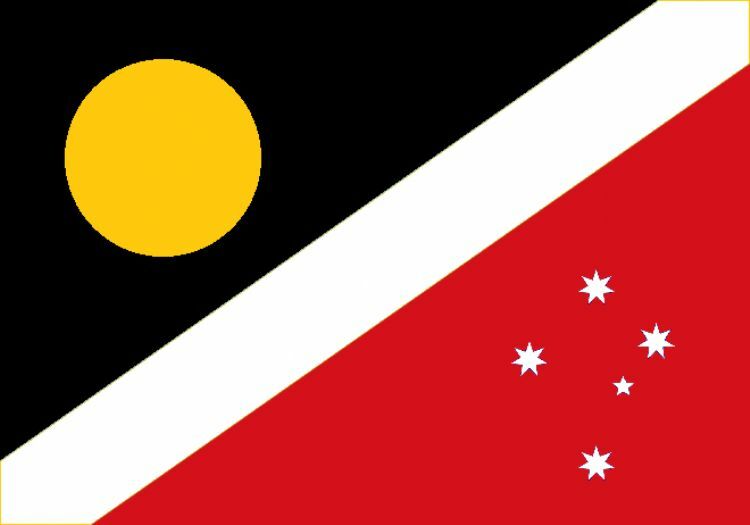 The white strip represents "those who've come across the sea" and the red represents the red soil of Australian outback and "the boundless plains to share". 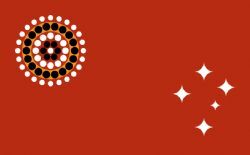 The Southern Cross on red is from the Red Ensign, symbolising Australia's British past, and all together it says "with courage let us all combine to advance Australia fair"
Based on John Blaxland's design, this is a simplified version and moved to a 2 by 3 ratio. It shows the history of Australia moving from left to right. 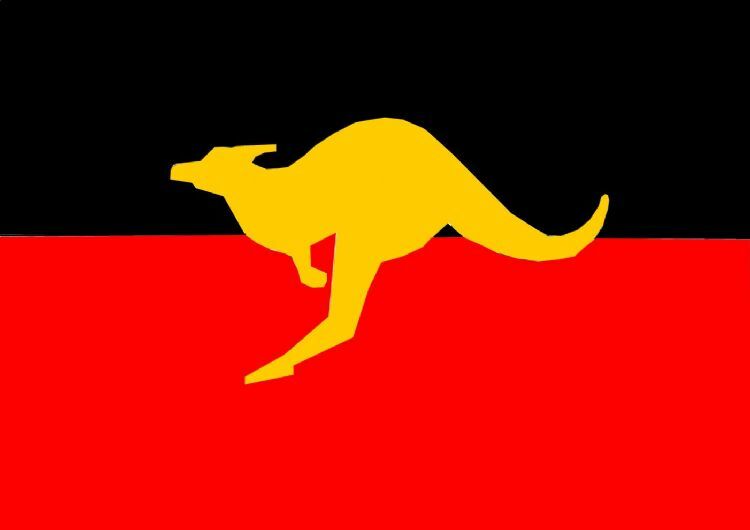 The background represents Australia's red earth, and the two symbols (placed so as to provide antisymmetric tension) represent various pairs of opposites - Sun vs Stars, Traditional vs Futuristic, Convex vs Concave, Day vs Night. 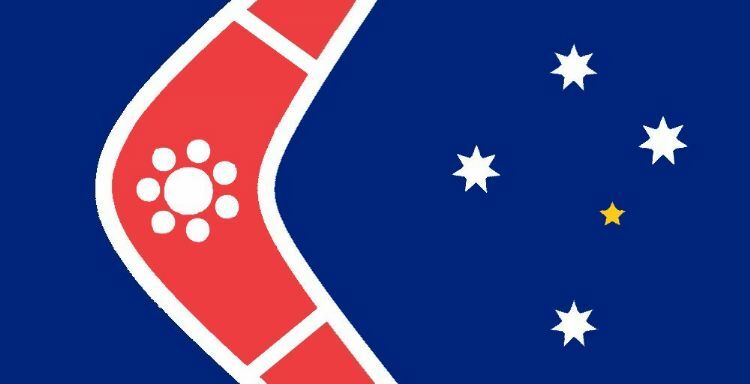 A dynamic new flag for a nation united under the Southern Cross. The Blue is symbolic of the oceans's that surround our island. The Gold is symbolic of Australia's national flower - the Golden Wattle. The Gold is also symbolic of the Australian spirit, and the richness of our land. The diagonal shapes are symbolic of ocean meeting land. The seven pointed stars of the Southern Cross symbolise the states and territories that unite Australia and Australian's. The Southern Cross is also symbolic of a constellation of Australian's, past, present and future. The seven pointed Green star is symbolic of our Federation and our pride in being Australian. An evolution of the current flag with the familiar red, white and blue colours retained and a small gold highlight added. The right hand side with the Southern Cross is unchanged, except that the small five pointed start is now highlighted in yellow/gold, to celebrate the fact that it has now been officially named Ginan, the name by which the Wardaman people of the Northern Territory have been referring to it for thousands of years and a name that has now been officially recognised by the International Astronomical Union (IAU). It is described as an “orange-hued” star. Gold is the colour of the golden wattle (the national floral emblem) and the colour worn by most Australian sporting teams. The stars on the first known flag to feature the Southern Cross (the Australian Anti-Transportation League Flag of 1849), were also in gold. The Union Jack is removed, with its red and white colours transformed into the shape of a boomerang – an image universally recognised as Australian. 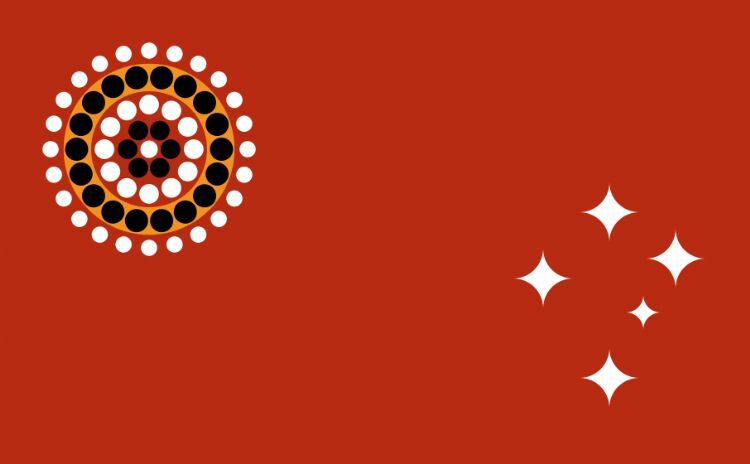 The seven pointed Commonwealth Star is retained, but redrawn in a style reminiscent of Aboriginal art dot painting, moved up to the centreline of the flag and rotated to point in the same direction as the boomerang device, towards the hoist. The shape of the boomerang frames the Southern Cross and works on two levels: the arc points towards the hoist much like an arrow head and so it looks correct in processions, etc, and due to the way a boomerang is thrown, it could be interpreted as flying towards the fly half and the Southern Cross, i.e. “returning home”. A simple mix of old and new that all Australians can relate to, but with a lot of meaning behind it. Evolutionary not revolutionary. 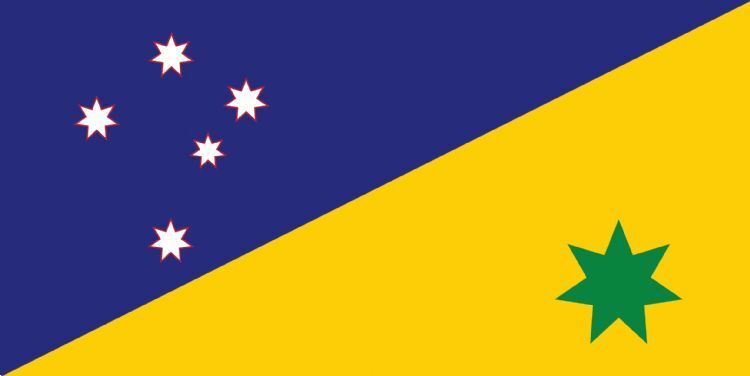 The southern cross is moved to the left with the Commonwealth Star centralised, filled with gold/yellow and moved to the right on a 1/2 green banner background. The colour of the commonwealth star also represents the sun of the Aboriginal Flag. The state flags could also use the same design replacing the Commonwealth Star/green background with the relevant state symbols.